alaTest has collected and analyzed 14 reviews of Panasonic HDC HS 25. The average rating for this product is 4.6/5, compared to an average rating of 4.0/5 for other Camcorders for all reviews. People really like the memory and viewfinder. The durability and image quality also get good opinions, whereas many are critical about the color and battery. We analyzed user and expert ratings, product age and more factors. 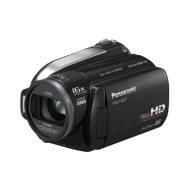 Compared to other Camcorders the Panasonic HDC HS 25 is awarded an overall alaScore™ of 80/100 = Very good quality. alaTest has collected and analyzed 7 user reviews of Panasonic HDC HS 25 from Amazon.co.uk. The average user rating for this product is 4.6/5, compared to an average user rating of 4.0/5 for other Camcorders on Amazon.co.uk. Comments about the viewfinder and image quality are on the whole positive. The usability and durability are also mentioned favorably, whereas some have doubts about the battery and portability. Easy to use, nice picture, lots of features. Can react badly tobright horizons, which washes out the colour. Take it off iA mode for much better results. easy to operate and its performance is very good. great all round camera easy to use, light ,easy step by step instructions to use , easy instalation on pc , what i would expect from a quality product from panasonic .